Struggling with acne? If yes, facial steaming can help you deal with it. It is a great way to keep your skin pores clean and prevent acne. I know that most of you are skeptical about trying this method, but facial steaming can offer you great results if done the right way. And this is what I have discussed here. Keep reading to know more. How Often Should You Do Facial Steaming And For How Long? Before you follow any skin care routine, you should understand why and how it will help you. 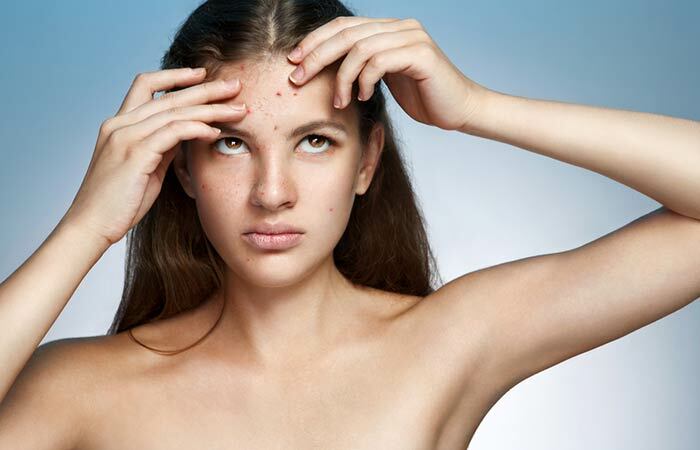 Acne is caused when the pores in your skin are blocked with oil, sebum, or dead skin cells and bacteria. An article published in PubMed Health reports that exposing the skin to warm water or facial steam helps in clearing and unclogging the pores (1). This is important for reducing acne outbreaks. Another study found that steaming the skin helped in increasing its permeability, which helps it absorb the acne medication or any other skin ointments better (2). In other words, facial steaming improves the efficacy of the skin ointments or creams you are using. Your skin softens after receiving steam, and anything that you apply works better (3). Now you know why those acne care ointments and creams were not helping you! Unless they reach the deep skin layers, they are not going to work – and facial steaming aids this process. Also, when your pores are clean, you no longer need to worry about those ugly zits coming back. Let’s explore some more benefits of using facial steam for acne. Using steam on your face helps open up the skin pores, clears the dirt, and eliminates the acne-causing bacteria. It also softens the blackheads and whiteheads (caused by blocked pores), making it easy to get rid of them. The facial steam causes perspiration. This, in turn, dilates your blood vessels and boosts blood flow to your face. Blood delivers oxygen and other nutrients to your face, making it healthy and glowing. Facial steaming helps in hydrating your skin. When your pores are open, they release natural oils that keep your skin moisturized and fight dry skin. Facial steaming improves the permeability of your skin, making it absorb topical medicines effectively. This means that the effectiveness of your topical medication also increases. 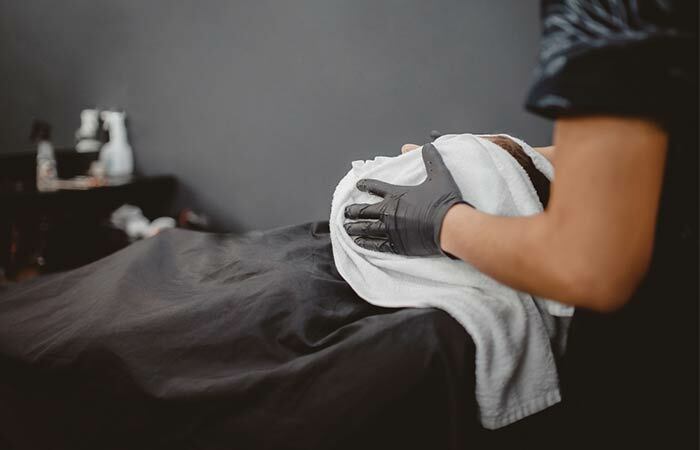 Your face receives an increased amount of blood after the steaming process, which also results in nutrients and oxygen getting delivered to it. This boosts collagen production, improves the elasticity of the skin, and reduces fine lines and wrinkles. Facial steaming is exceptionally soothing and relaxing. And when you add essential oils to the water, it’s like a complete aromatherapy session that not only makes your skin glow but also soothes your senses. The best part is that you can easily enjoy all these benefits right at home! Here’s a step-by-step guide to steam your face at home. Step 1. Place a big bowl on a table. Pull a chair and adjust its height to that of the bowl on the table. You can do this in your sink. Block the outlet and place a chair near it. Adjust the height as per your comfort. Step 2: Secure your hair with a rubber band or a towel. Use a mild cleanser or an exfoliator to exfoliate your face and neck gently. Step 3: Boil water. The quantity of water depends on the size of the bowl or sink. Step 4: You can add a few herbs, such as peppermint, eucalyptus, rosemary, lavender, and chamomile, to the warm water. Or add any essential oil of your choice. If you are using herbs, add them before you take the pan off the burner, and if you are using essential oils, add them after you pour the water in the bowl/sink and it has cooled down a bit. Step 5: Once you have poured the water in the bowl/sink and added the essential oils (if you are using them), put the towel over your head and bend over the bowl/sink. Keep your face 6 inches above the bowl/sink. Step 6: Adjust the distance as per the amount of heat you can bear. You can mist the corner of the towel every moment you need to cool your face down. Step 7: Do it for not more than 10 minutes. Start by following steps 1 to 4 in the method mentioned above. Then, do the following. Step 1: Soak a fluffy and clean towel in hot water and wring it well. Step 2: If you are sitting in a chair, lean back and place the hot towel on your face. Adjust it in such a way that it covers the entire face. You can do the same while lying down. Step 3: Do not continue the session for more than 10 minutes. Break down your session to 2 minutes for each step. Step 1: Buy a facial steamer. These are readily available online. Step 2: Read the instructions carefully to know the amount of water to be used. Fill it up accordingly and place it on a table, adjusting the height with that of the chair you will be using to sit during the session. Step 3: Secure your hair using a towel or a band. Cleanse and exfoliate your face with a gentle cleanser or exfoliator. Step 4: Place your face on the cone-like opening on the top of the steamer. Make sure you keep your face at a distance (as mentioned in the instructions). Step 5: Take the steam for 2-3 minutes at a stretch. Take breaks in between to see how your skin feels. You should do this because, compared to the other methods, facial steamers give out strong steam. 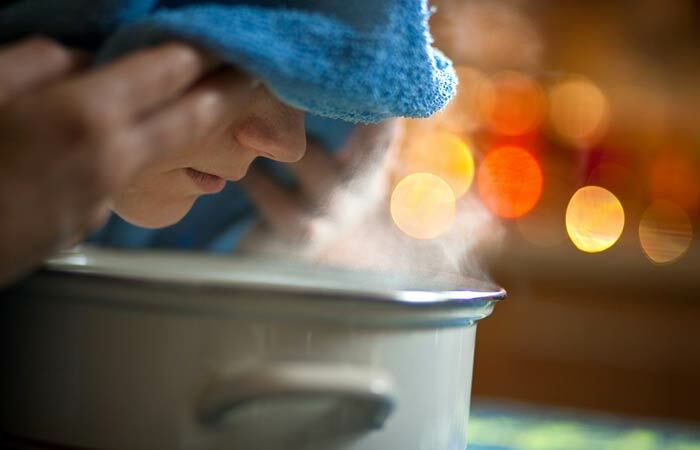 Once you are done with the steaming process, pat your face dry or let it dry naturally. Apply a healing mask that contains ingredients that your skin can absorb easily for that added glow. You can even apply skin serum or cream on your face. Now, the next question is, how often can you do facial steaming at home? Here’s your answer. We know that anything done in excess is not good. Excessive steaming is bad for your acne as it can aggravate the condition. Hence, it is best to steam your face once a week. However, if your pores are excessively clogged, you can do facial steaming twice a week – but not more than that. You can continue this for two weeks and switch to the once-a-week routine after that. Usually, steaming should not be done for more than 10 minutes at one go. However, you can adjust the duration based on your skin type. For sensitive skin: Consult your dermatologist to know if your skin can tolerate steaming or not. If you want an exotic spa-like feeling, you can always experiment with essential oils. But which essential oils should you choose? 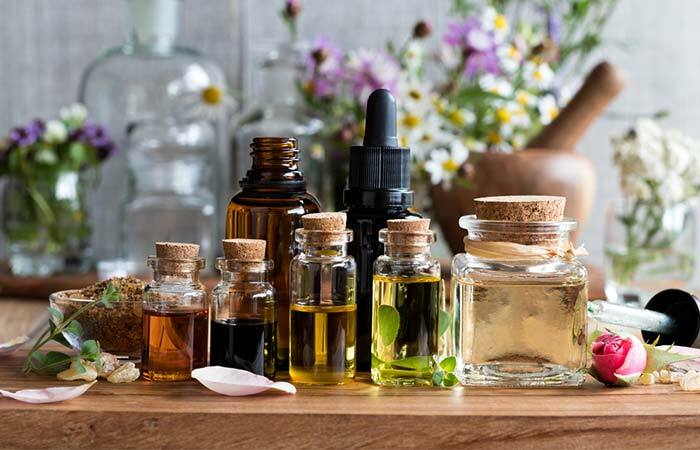 The type of essential oils you use depends on what suits your skin (usually, all essential oils are harmless – unless you are allergic to them). For acne, use tea tree oil and rosemary oils. If you have dry skin and acne, use tea tree oil in combination with jasmine and rose essential oils (any two or all three). If you have sensitive skin and acne, use tea tree oil, lavender, and geranium oils. Make sure you don’t use more than 2-3 drops of any essential oil (if you are using a bowl or facial steamer). If the water quantity is more (like in a sink), you can add 4-5 drops of each essential oil, but not more. The process is a bit time-consuming, but you don’t achieve good results without effort, especially clear and healthy skin. You have to take out time to pamper your skin. 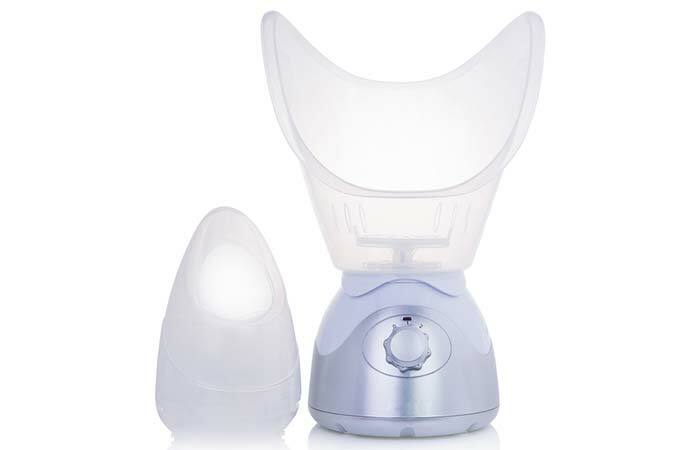 Regular facial steaming ensures that your skin secretes natural oils, without blocking the pores. So, why wait? 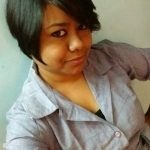 Give it a shot, and I am sure you will like it. And, of course, don’t forget to share your experience with us in the comments section below.